Doubt has the ability to creep into the hearts of the most committed. Thomas, one of Jesus’ closest disciples, dealt with doubt in his relationship with the Lord. And sometimes we as Christians wrestle with doubt in our faith walk, but in today’s post I want to share some ways to overcome it. Jesus explained to his disciples on multiple occasions how he would be crucified and rise again. But Thomas wasn’t certain. He had some doubts about his knowledge of what to do next. Have you ever doubted yourself? Have you ever been uncertain about your future, career, or your relationships? We’ve all had doubts at some point in our lives. Here are some tips to help you deal with doubts. Be clear about your doubts. Thomas expressed some details about his uncertainties but he didn’t accurately clarify his doubt. He was unsure about where Jesus was going and how to get there, but he didn’t clearly express his personal doubts. He doubted his ability to recall the teachings and follow through on the plan. If you’re having doubts, here’s a definition of doubt to help you get started clarifying your feelings. 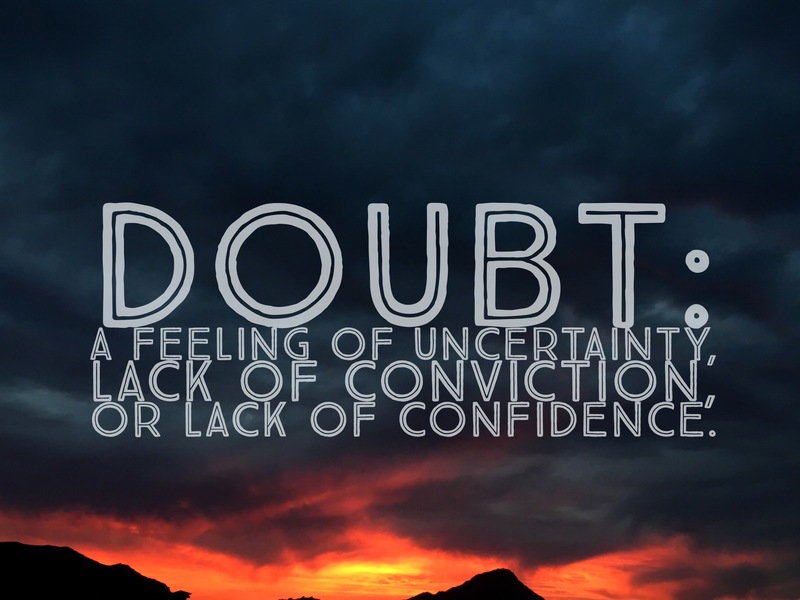 Doubt: a feeling of uncertainty, lack of conviction, or lack of confidence. Now that you have a definition, ask yourself “What is making me uncertain? Why do I lack conviction? Why am I not confident?” Then, express it in one sentence. Thomas did the right thing by talking to Jesus. Jesus was the one person who had the plan, and all of the answers. When you have doubts, it’s important to get the right help from the right people. I’ll admit, venting your frustrations may make you feel good, but venting to the wrong people doesn’t address your doubts. So, my advice is to go to the source. Go to the person you’re accountable to in the situation. Express your doubts and ask for their help. I have one word of caution though: go to them alone. Here’s why; Thomas expressed his uncertainty out loud in front of the other disciples and it spread. Look at verses 7-8. Thomas’s doubt has spread to Philip who then expresses his uncertainty. Doubt can grow and gain ground in a group like weeds. I think they call it “sowing seeds of doubt.” Don’t be that person. Instead, go to source alone and give them an opportunity to help you overcome your doubts. This last tip is critical because your attitudes toward your doubts can be your biggest obstacle. 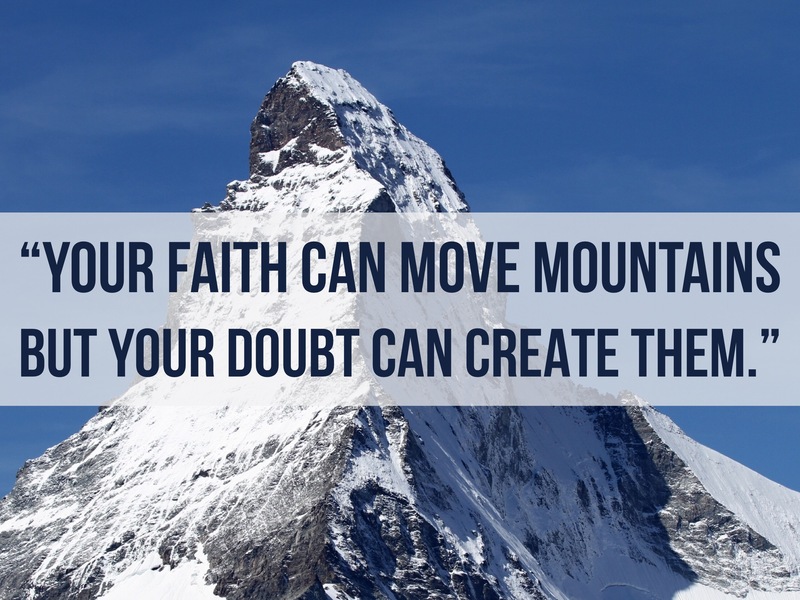 Your faith can move mountains but your doubt can create them. In this verse, Thomas refused to believe. He basically built a mountain of doubt and said only an earth shaking miraculous revelation could move it. If you’ve already made up your mind and put stipulations on your doubt as Thomas did, no amount of talking will help you. Thomas could’ve shared in the joy of the resurrection of Jesus with his fellow disciples sooner if he was more open minded. Instead, he held fast to his doubt until he was confronted by Jesus. Don’t allow doubt to hinder your blessings. Doubt can sap your energy and steal your joy. Doubt can make you stagnant, afraid to step out in faith. Doubt can cause you to miss opportunities because you were too uncertain to seize the day. I hope this post helps you strategically overcome your doubts. Previous Post Say Yes to No. Here’s how. Doubt is a trick of the devil. It is the opposite of faith. To doubt is to be an unbeliever.